Companies felt workers were too busy preparing for the holidays and not finding a job. The 4th quarter budget couldn’t take a salary hit so it was better to wait until the new fiscal year. Speaking of new year, companies believed workers were more motivated to look for new jobs in the New Year. And honestly, companies didn’t want to put time and money into looking for candidates either, because it was the holidays for them too. 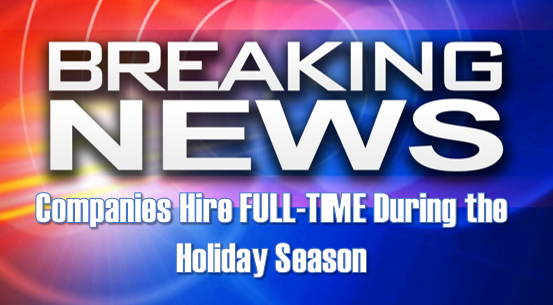 Well, those days are over and the holiday hiring freeze is a myth! The last few years I have noticed first-hand that people; workers; talented workers, are looking for new opportunities all the time, even during the holiday season. And surprisingly enough companies were/are hiring throughout the fall and winter months. Remember, things have changed and desperate times calls for desperate measures. Companies have to keep looking because you never know when that perfect candidate could apply. Also, just as companies are hiring, unfortunately some companies are laying off during the holidays, this gives competitors the perfect opportunity to nab some really good (and thankful) talent. Another reason why hiring continues is because the holiday season does not mean as much as it used (for many people). I love the holidays, because I think, in general, people tend to be a little nicer, unless it’s Black Friday and then it’s every person for themselves – but point being, we are a more diverse nation and workforce with various religious backgrounds and traditions, so that means, it’s just business as usual. An additional reason why hiring picks up during the holidays is because we spend a lot of money on sales. However, It’s not simply retail jobs that hire, it’s supply chain, technology, manufacturing, and so much more. Last year (2015), I had 4 personal friends (not clients) to look for and find new jobs in October, November and December. These were corporate jobs with 6-figure salaries. So trust me folks, don’t stop looking during the holiday season because now is the time to find that next great job.